Life and Death by Stephanie Meyer, Sci Fi. 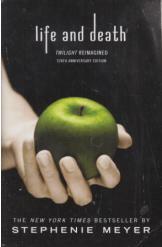 In this gender-flipped version of the original "Twilight" novel, teenaged boy Beaufort Swan moves to Forks Washington and falls in love with the moody, enchanting vampiress Edythe Cullen. Book is in good condition, all pages intact.